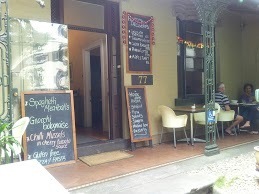 Strolling down Glebe Point Road in search of a decent lunch, my friend and I spotted Fountain 77 and headed in. It was an unlucky mishap that we had been seated in Fountain 77, as we had mistaken it for Cafe Otto, an Italian restaurant that was situated to the left of Fountain 77. 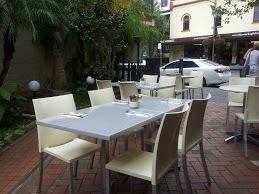 The set up of both restaurants are deceptively similar, with an outdoor courtyard, and both also serve Italian cuisine. However, it was too late to leave as we had placed our orders with the waitress already. We took seats in the outdoor courtyard section, and waited for our food to arrive. The day was cloudy and slightly warm, and it was nice to sit outdoors and bask in the ambience. It was 2pm, and as we'd arrived a few customers had left. There were a few other people chatting over their meals, but it was relatively quiet. 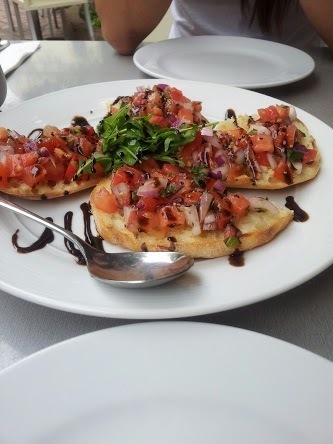 We ordered the Classic Bruschetta ($12) as an entree to share, which didn't take long to arrive. It consisted of diced tomatoes, rocket leaves, red onion, and basil atop four slices of toasted bread, with a dollop of balsamic glaze. The bread was crisp, while the tomatoes were cool and fresh. 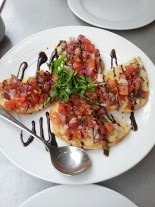 The red onion added a hint of acidity, that contrasted with sweetness of the balsamic dressing. It was the perfect way to start our lunch. After we finished our entree, a waitress cleared our plates and brought our mains shortly after. My friend had the Gnocchi Bolognese ($17) while I had the Prosciutto Calzone ($19). The gnocchi bolognese looked rather more appealing than the prosciutto calzone. The sauce was full of flavour, but the gnocchi was a little bit overcooked and lacked firmness. The texture of the gnocchi was a little bit mushy, but it still tasted fine. A calzone is a folded over pizza crust containing the usual pizza toppings inside of it. It's a staple of Italian cuisine not commonly found in Sydney. As I always enjoy the novelty of eating uncommon foods, I decided to order it as a main, but instantly regretted my decision upon sight. The prosciutto calzone at Fountain 77 lacked the firm pastry of other calzones I'd previously had. 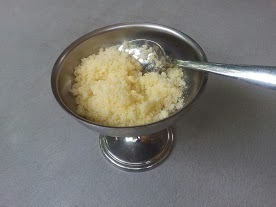 It had been cut into pieces and oozed mozzarella cheese. 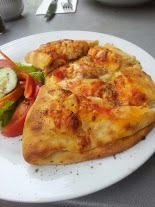 I felt that the pastry was weighed down by the mozzarella cheese and other ingredients throughout the calzone. The calzone pastry was slightly thin, and not very crisp. It was much too flat, and the cheese made it a little bit greasy, but on the upside, it was quite filling. The ambience was quiet and pleasant. The outdoor courtyard was a nice setting to have lunch in, and there weren't a lot of other diners, making it the perfect place to catch up with someone. I enjoyed the bruschetta and bolognese gnocchi, but felt that my calzone had been a letdown. The waitresses that had served us had been friendly and polite. 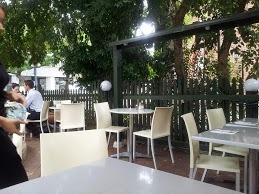 There was nothing too remarkable about the food, service or ambience; but it was a nice place to have a casual meal in the inner city area. When: Open for breakfast, lunch and dinner 7 days a week.